Co-Artistic Directors Kristin Howe + Joanna Lees come together for their first choreographic collaboration featuring epic live music by Grand Symphonic Winds with Special Guest, world-renowned Soprano, Lindsay Kesselman. 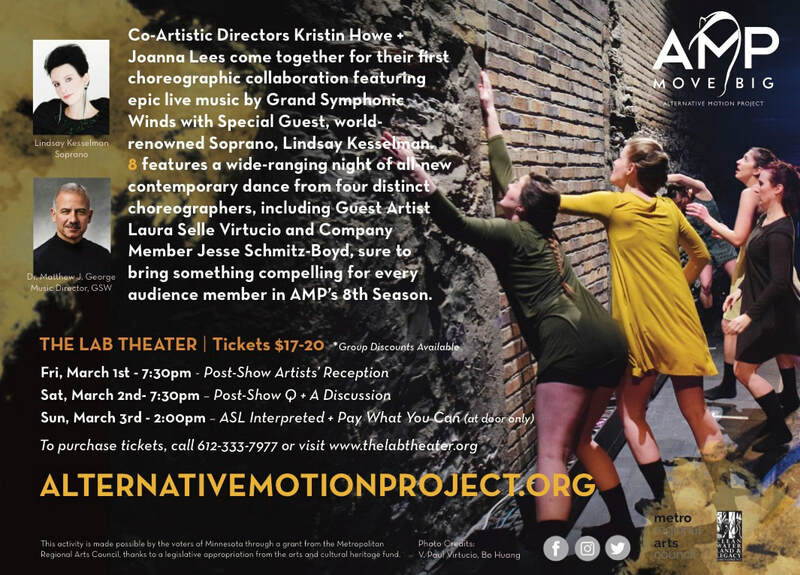 8 features a wide-ranging night of all-new contemporary dance from four distinct choreographers, including Guest Artist Laura Selle Virtucio and Company Member Jesse Schmitz-Boyd, sure to bring something compelling for every audience member in AMP’s 8th Season. On the Horizon (World Premiere – Kristin Howe + Joanna Lees, Live Music by Grand Symphonic Winds and Special Guest, Soprano Lindsay Kesselman) – For the first time in AMP’s history, Co-Artistic Directors, Kristin Howe + Joanna Lees will collaborate on the creation of a new dance work for a group of nine dancers. Ideas of conflict, community, isolation, desperation and hope in a desolate world are highlighted within a whirlwind of bodies to the score of Lights from a Yellow Star by composer Boris Pigovat. Sharing the stage with AMP is Grand Symphonic Winds, a 55-person wind symphony ensemble. 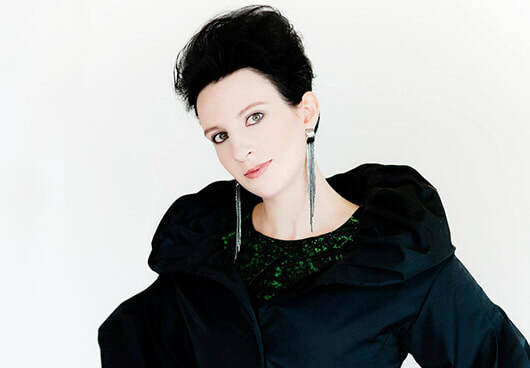 Joining GSW and AMP is world-renowned Soprano, Lindsay Kesselman, who has numerous performance credits from all over the world, including the revival of Philip Glass’ Einstein on the Beach. She is quoted as having “a voice of goddess-like splendor” (Fanfare, 2017). STILL AGAIN (World Premiere – Guest Artist Laura Selle Virtucio, Original Score by Dan Dukich) – This work is Laura Selle Virtucio’s first work for AMP. It fills the stage with fluidity activity, dramatic tension and shifting group dynamics as five dancers seek connections within the organized chaos. 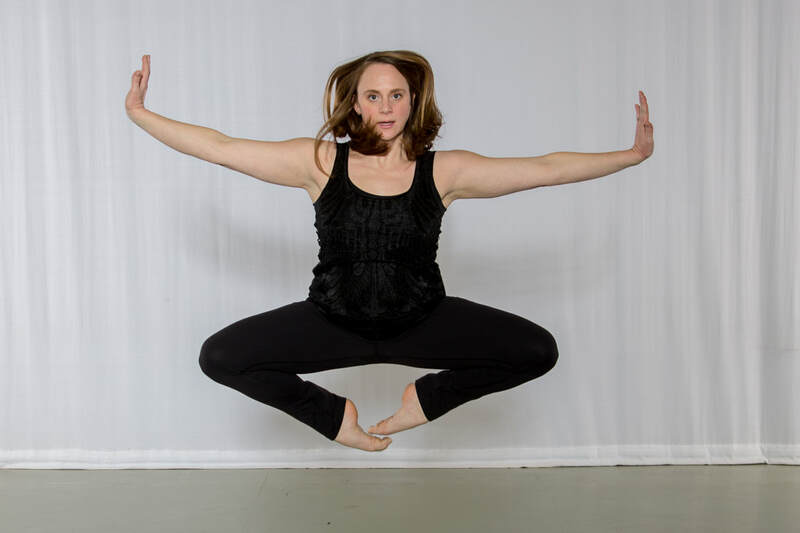 “I want this work to come from a place that honors the experiences I’ve had with the choreographers whose processes and movement vocabulary shaped my professional history,” Laura says. An original score by sound designer Dan Dukich drops the audience right into the drive. Dan’s work has been heard on stages throughout the United States and Europe. 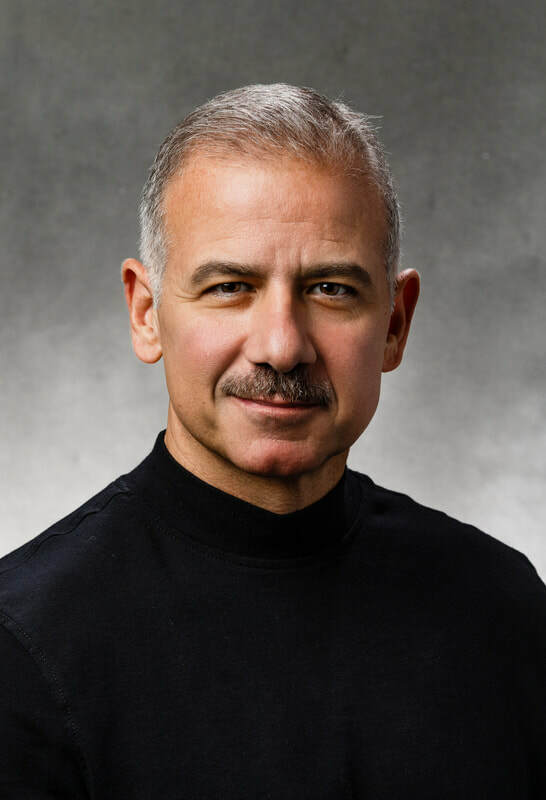 He has been recognized by The Kennedy Center with a Distinguished Achievement in Sound Design Award and supported by Nautilus Music-Theatre's Composer-Librettist Studio. Dan is also a songwriter and records and performs with the moniker Daniel Bonespur. TheSystem (World Premiere – Company Member, Jesse Schmitz-Boyd, Original Score by Matthew Kojetin; Audience Create-A-Dance) – AMP administered a public survey, giving our supporters the chance to directly affect the creative process and vote on aspects of one of our newest works. These results are the framework for a world premiere by company member Jesse Schmitz-Boyd. TheSystem is a new quartet investigating hierarchies that are both chosen and unchosen. Segmentation, categorization, specialization and uniformity lay at the heart of the work. TheSystem is here for you. Original sound score by Matthew Kojetin. Spiral Into Control (Minnesota Premiere – Joanna Lees, Live Music by Special Guest, Soprano Lindsay Kesselman) – This work originally premiered in New York City as part of Doug Varone’s choreographic mentorship program, DEVICES. This female duet evokes a haunting relationship that explores concepts of support, miscommunication, tension, and the effect of human connection with music sung live by Special Guest, Lindsay Kesselman.